You may think an 800+ credit score is out of reach given that only 18.3% of consumers have scores that high — but it's possible if you know how to manage your credit. It doesn't matter if you apply for a mortgage or an auto loan, an 800 credit score gets your foot in the door with lenders without much effort. People who belong to the 800 Club have demonstrated excellent credit habits — and that's a little like having a permanent hall pass in high school. Since these people are less likely to default on their bills, they're a creditor's dream applicant and banks will vie for their business. As long as you have sufficient income, you can walk into practically any bank and get what you need. On the flip side, if you have bad credit, the bank might reject your application until you've made improvements to your score. You don't need perfect credit to get a credit card — when you're young they hand them out like candy (I learned that lesson the hard way) — but the higher your credit score, the more perks you'll get. Some people with low credit scores can only qualify for secured credit cards, which require a security deposit. But as your credit score improves and you hit the 800 mark, you'll qualify for some of the best credit cards around. These might include features such as unique rewards programs, concierge service, and other high-end benefits and unique perks — just for proving you know how to manage credit. Some employers include credit checks as part of the employment process. It isn't enough to have education and experience anymore; they want to make sure you know how to manage your personal finances before they trust you with the company's finances. This is especially common with government jobs and jobs in the finance industry. An 800+ credit score can push your application to the top of the pile. Let's say three people applying for a particular job have the same amount of education and experience, yet two people have a credit score in the 600s and one has an 800 score. If the employer feels each applicant is a good fit for the position but can only choose one, there's a good chance he'll select the person with the highest credit score. Not only does an 800 credit score practically guarantee you'll be approved for most loans, you'll also get a low interest rate. Some auto lenders occasionally offer 0% financing, but qualifying often requires a score 800 or higher. Zero interest financing is the same as paying cash, so you'll save money over the life of the loan. Even if your lender doesn't offer 0% interest, an 800 credit score means you'll qualify for the most favorable rates. This can lower your monthly payments and potentially increase buying power. 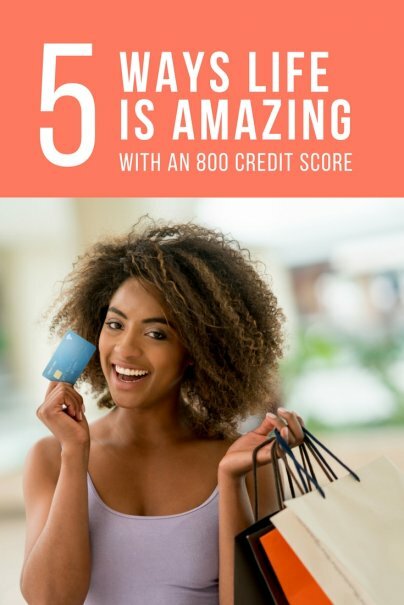 And if you're looking to take advantage of a credit card with a 0% introductory rate, a near-perfect credit score puts these accounts within your reach. It might come as a surprise, but when you apply for some types of insurance, such as auto insurance or renter's insurance, some insurance providers will check your credit score, using your rating to help determine the premium. (Unless you live in California where credit based rates for auto insurance are banned, and Hawaii and Massachusetts, where credit-based insurance rates for both homeowners and auto insurance are banned.) This may seem unfair and unnecessary, especially since we don't finance insurance. But the way you manage your credit cards and loans is a pretty good indicator of how you'll manage your insurance payments — and your overall riskiness. From an insurance company's standpoint, people with the highest credit scores are usually more responsible with their credit and money, and this level of responsibility justifies a cheaper premium. Do you have an 800 credit score or higher? How is your life easier because of it? Humblebrag about it in comments! My wife and I, both, have scores north of 800. To be honest, I don't see any extra benefits. That's probably because we have no debt other than our mortgage and don't pursue more debt. I imagine others with similar scores have similar attitudes. I'm going to look into the insurance part of that though. I have 826 on TransUnion and 821 on Experian...now what can I get in that stratosphere of credit score? I co-signed an auto-loan for my daughter (who is just starting out and has no credit) but was declined with a credit score of 844. Should've been a co applicant. As a co signer they don't factor in your earning power, just hers. Person w great credit should know such things. Bill - a co-signer is a co-applicant. Did you mean co-borrower? Person w great credit should know such things. I found out that my score was 818 when I went to buy a car, and got lowest available rates on my car loan. When I bought my house, I had no problems getting approved. The lender however told me that anyone with the score over 735 gets the best rates. 800 is definitely a good psychological mark to achieve, but I think that most lenders give you best rates if your score is considered "excellent", usually 740 and up. Mine is 837, wife's is 847. Pay your bills. Your word is your honor! Very nice scores .... Wife and mine way over 800 as well! Took 11 years to reach an 800 credit score on my own (29 year old without a home mortgage), but I do receive many credit card offers, and do collect 2%+ cash back on every purchase with my card, with 0% interest seeing as its paid off every month.. But didn't need an 800 credit score for the best credit cards offered, ~mid 700s will suffice. Same I can't seem to get any higher right now. Later on when I purchase my own car and pay mortgages will it go up. Credit scores are the way our elite dangle carrots for those of us who aren't pacified by prime time sitcoms and reality shows. People with money couldn't give a crap about their credit scores. This is something for the rule followers to show that they follow the rules, but in reality, provides no real benefit except in taking on debt. Why take on debt in the first place? Maybe you should ask that. What you say is true overall. It makes no sense at all to take on debt although some people have no choice. Be glad you're not one of them. It DOES make sense to use credit cards to pay for as much as possible IF you can afford to pay off the balance each month. In that scenario, I (for example) make about $500 or more each year in cash back points. So, yes--do you best not to take on debt. But DO use credit cards if you can pay off the balance each month...and earn money doing it. i want to buy a plane, when i stop dropping all my money into new businesses i will get a loan on one. This loan is stated income is pretty much based off credit. My 800 score will help me buy that plane. Great, I have 800 score, but...I still have $60,000 school loan debt and $10,000 credit card debt, also from school. I make $55,000 salary and live paycheck to paycheck...this pay period I've run out and will need to use a credit card again to put gas in tank and food on table. I'm proud that I went back to school and "improved" myself but I'm not proud that I'm still broke. Graduating in the middle of the recession cut my salary in half. My car has 230,000 miles on it. I paid $3500 out-of-pocket for medical bills last year, and my doctor says I likely have worse upcoming. I don't have parents to live with and I don't have children to take care of me when I'm older. I don't own a home and can't see that changing in the future. I highly doubt that you have a 800 credit score. My husband and I have a credit score over 800 and have had a zero percent credit card for the last 6 months. Also our home loan refi to a 15yr loan was a breeze. They basically gave us the lowest rate possible and ushered us through. That bit about employers choosing "the person with the highest credit score" is nothing but conjecture. I'm not certain it would even be legal for HR to share credit score information with team leads/hiring managers. In 26 years working for (and conducting interviews within) businesses such as Chase, Shell, and IBM, I have YET To EVER see an applicant's credit score. If you are applying for a position which requires a security clearance (as was the case during my time working for IBM BCS), then that's a different story. However, even then, an applicant's status in the candidate pool had zip to do with their credit score. Lame article written by someone who is merely parroting frequently (and wrongly) touted information. That aside, it still never hurts to be fiscally responsible and pay your debts. I think more than anything, the psychology shift of achieving 800+ is the big takeaway. It says a lot about yourself as a character. Its a trust-builder. A lot of 800ers agree that 800+ doesn't mean jack-squat compared to high 700s, but if you can trick yourself into believing that 800+ means so much, you can have to confidence to negotiate terms and approach business situations with a position of strength to back you up. After all, 800+ does reflect a certain type of character of achievement. It's a painstaking high score that doesn't produce any great reward. it can only come from a development of great habits. Congrats to everyone that have broken through the 800 barrier! My credit score just got back to 800 after being in the high 700s for a year. It had been in the low 800s for several years before that. I currently have close to a $1,000,000 debt from investments and a business purchase and just turned 27. Good credit is mostly about good management practices, not about having money. Congrats to all the others in the 800 club!! !